I used to read a lot of self-help books. You know, the ones that tell you how you can achieve inner peace. Some of the recommendations were to begin practicing Qigong (pronounced ch’i kung), an ancient Chinese meditative practice. Others recommended Feng shui (pronounced fung shway), which is an ancient Chinese system that, when practiced, is supposed to balance the energy in your home as well as bring in peace and harmony. And then there was yoga. I practiced Qigong for a while, and it did release the flow of my body’s energy thus putting it more in alignment with my mind. Then, I dabbled in Feng shui but I must admit that I had a hard time seeing how the placement of certain furniture in certain areas of a room would somehow bring me the permanent peace I was searching for. I will say, however, that there is something to be said about the proper flow of space and energy in a room. After all, you can’t just plop a sofa down crookedly in the middle of the living room, and expect to feel comfortable when you go in there to relax. I then went on to yoga. And again, this is truly beneficial to the body. It could be said that if the body feels relaxed, the mind will follow, and then the spirit…supposedly. But the peace I was searching for I could not find because those were all conditional kinds of peace, applicable only for as long as I practiced them. And there was my answer. 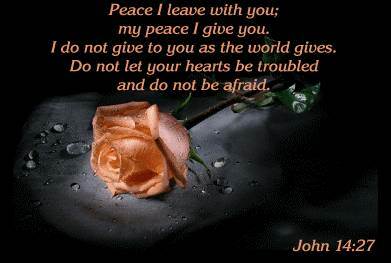 Jesus promised to give me His peace, and I’d say that trumps all others…especially the so-called peace that the world has to offer. So I asked myself this question: If the world has so much peace to offer. Why is it in such turmoil? I now have the peace I was looking for. It’s a settled kind of peace. It’s not the kind of peace that I have to struggle and fight for everyday. Sometimes, – because I am living in this world – I do need to go to God in prayer and ask Him to increase my peace or renew my soul. And He comes through for me every time. And I don’t have to move a piece of furniture in order for Him to do it. The type of peace I wear is not a masked kind of peace. It’s not a pretended peace where if the wrong thing is said at the right time, I’m going to explode. I might grumble a bit, and even that I have to work on. But Jesus Christ is there to help me, guiding me every step of the way. Jesus gives me the inner-peace I need. He’s the true source, and the captain of my mind and spirit. He’s the only one I look to for the contentment of my soul. This picture was taken outside of a friend’s home after an obviously rainy day. I like rainbows. Every time I see one I marvel at the creativity of it all, and the beautiful blend of colors from lime green to lemon to cranberry with a little violet in between. It is a piece of artwork that no man can create. 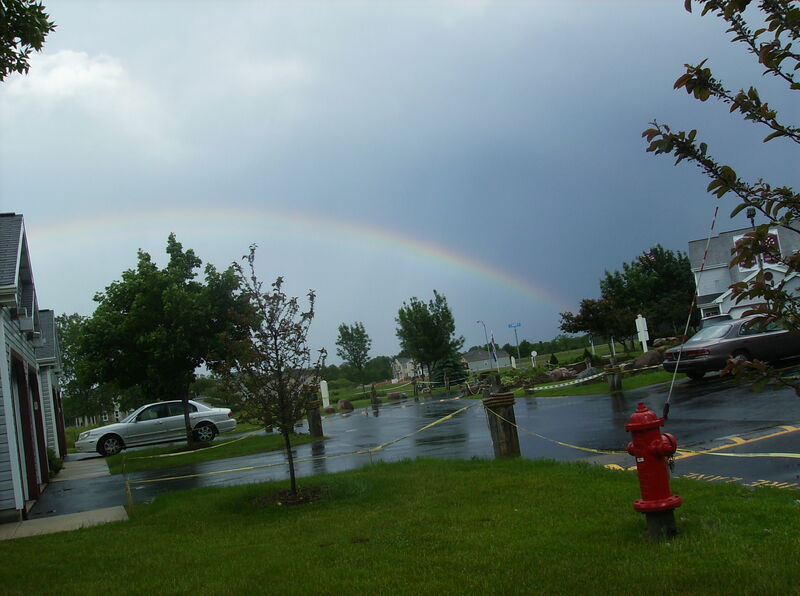 When I look at a rainbow, I am reminded of God’s promise, and I am comforted. The rainbow, He said, is a “token” of His covenant between Himself and the earth; a promise that it will never rain so much again as to destroy the earth by flooding. This past summer, the city of Milwaukee experienced flooding unlike anything we’ve ever seen. I was one of many caught, trapped by the high rising waters produced from a very rapid and heavy rainfall. At first I did not think too much about it, but as I made my way to an intersection, still miles and miles away from home, I became astonished to see the waters rapidly rolling across the street divider. It was then that I begin to feel that something was not right, that this was not a normal rainfall. The waters continued to rise, but I remembered God’s promise. I had to abandon my car on a steep hill about a mile from my house. I could see other cars already semi-submerged under water on the street below. I had to think of another way to get home. I began walking down the rail road tracks, hoping to get to the other side. When I arrived I was met with yet another impassable area of flooding. A warehouse owner was kind enough to allow me to pass through his warehouse to the other side of the street where the water level not that high. I began walking, the rain kept falling, and I kept remembering God’s promise. There may have been a rainbow in the sky that day. Sometimes its faintly present, sometimes its arch is so bright there’s no missing it. I didn’t see it, but I still saw God’s promise in that the earth was still here; it had not been destroyed by flooding. So, whenever I do see a rainbow, I make time to appreciate its glorious image. Besides being beautiful, it is a promise you can actually see.